Mind your peas and beans…. “legume.” Webster’s Third New International Dictionary, Unabridged. Merriam-Webster, 2002. http://unabridged.merriam-webster.com (17 Jul. 2011). I brought up the subject of purple-hulled peas since they are seasonal. Unless you are a native Southerner you likely don’t know about this vegetable. I’m not–and it took me a lot of research to find out what I wanted to know about peas and beans, which is which, and what is what. At the risk of being a bit didactic, let’s start with legumes, which are ancient foods–good sources of protein, carbohydrates and fiber. We should all eat more of them! A list of legumes would include beans, peas, soybeans, peanuts and lentils. For now, lets just talk about peas (Pisum sativum). When I say peas, you probably think of “garden” peas–those lovely bright green vegetables that are harbingers of spring. There are English peas (shelled as the pod is inedible) and the edible-pod peas (snow peas, sugar snap peas or mange-tout). There are also “field peas”–which are really the form of pea that is grown to be dried (on the vine) and would include yellow and green split peas. Beans include broad beans (Vicia faba) and the common or horticultural bean (Phaseolus vulgaris)–also in pods–again legumes. When I say “bean”, you likely think of those green things meant when we say “green beans”, “snap beans” or “string” beans. Then you might think of dried beans. But did you think of “shell” beans? Bet you didn’t–unless you’re a Southerner or unless you grew up on a farm where you grew your own food. Those are all life stages of beans–first comes the pod which we eat as the “green bean”, This is an immature form–picked very young these can be haricots verts; a bit more mature and they are string or snap beans. 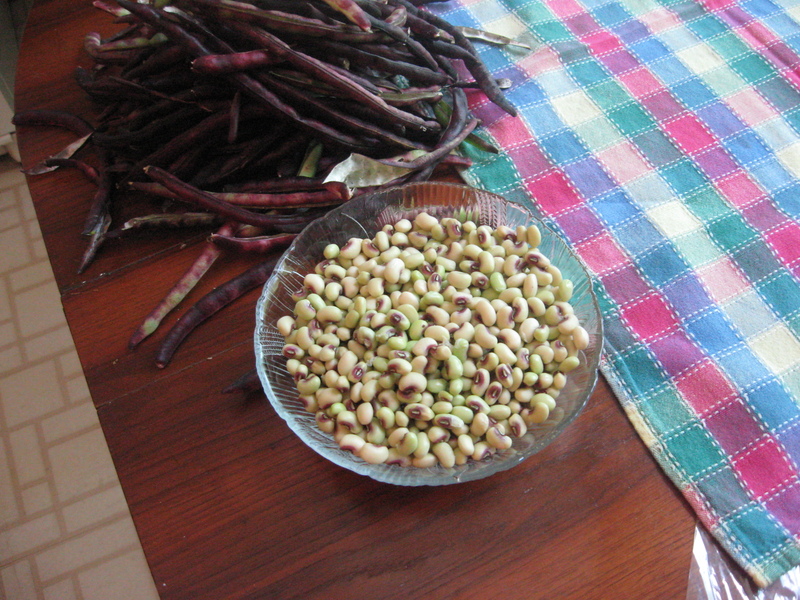 The shell bean is the mature, but not dried, bean. If you leave the pod on the plant to dry in the field, then you have dried beans–black beans, navy beans, pinto beans, et cetera. For more detailed information on many varieties of Phaseolus vulgaris see The Versatile Grain and the Elegant Bean (bibliography). Then there are lima beans: Phaseolus limensis (large lima beans frequently Fordhook, Phaseolus lunatus which are small lima beans (also called sieva beans, baby lima beans among other names) which are believed to have first been domesticated in the new world. So, what are crowder peas, purple-hull peas, black-eyed peas, pigeon peas? 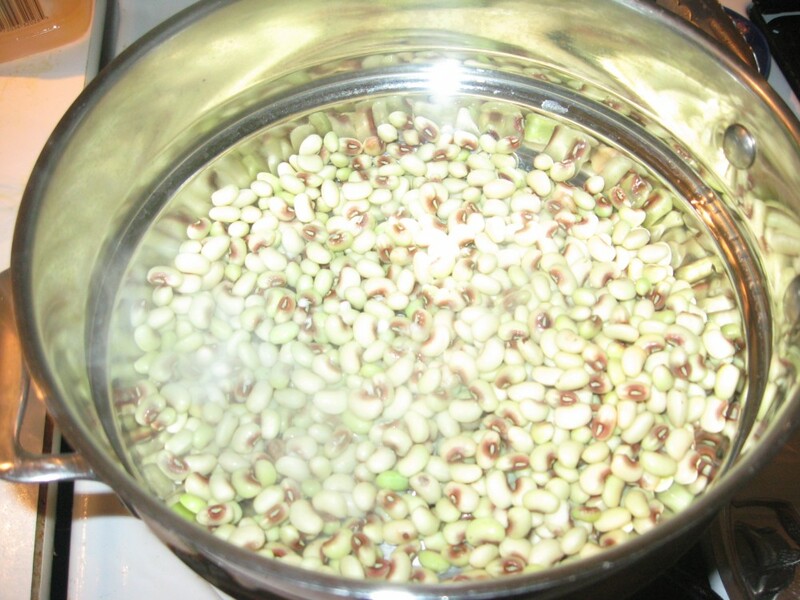 Those are subspecies of cowpeas (Vigna unguiculata) sometimes called cowpea beans. They do look more like beans than like peas, but pods are not edible as are the common (or horticultural) beans. So these are really neither the common bean nor the peas we know as garden peas. They are their “own thing”. So who cares? I just wanted to know–think of how you can make conversation at the next cocktail party! The really important thing is that the legumes (lentils will come later) are an important source of protein, carbohydrates, and fiber for animals and we should use more of the as people food. So, back to the questions that really started this: how do you cook purple-hull peas? You’re not going to find out by looking up purple-hull peas in the index of a cookbook. Look for recipes for black-eyed peas or for fresh shell/shelled beans and you should be able to substitute you shelled purple-hull or black-eyed peas in those recipes. I’d strongly recommend looking at a vegetable cookbook like The Victory Garden Cookbook. (The information here has been gleaned from multiple sources, but is mainly from this cookbook). Some guidelines for buying: you can likely expect about 50% loss when you shell them–so if you have bought a pound of these in the shell, you will end up with about 1/2 pound shelled. If you’re not going to cook them immediately after shelling, refrigerate in a zipper-lock bag with a very slightly damp paper towel to keep moisture even–it will soak up condensation or add a bit of moisture if needed. I wouldn’t keep more than a week…the sooner you cook any vegetable after harvest the better. You can blanch/boil/braisethem: cover with water, add seaonings if desired, and simmer until tender or partially cook with minimal seasonings andthen finish with additional seasonings or ingredients with another cooking method. For small beans/peas like these it may take no longer than 5 to 10 minutes to be tender, but they do keep their shape well even with longer cooking times. The braising is really just cooking in water at a gentle simmer, using a minimal amount of water so you’ll need to keep an eye on them to see that they don’t dry out/burn/scorch. Once they are cooked, you can add some “finishing touches”. If you cook them without much seasoning, you may be able to use them in a number of different ways. after boiling or blanching, add some butter, salt and pepper to taste, and maybe a squeeze of lemon juice. you can add cream and reduce it to a thicker sauce. bake with a Béchamel/velouté sauce, topped with cheese, until bubbly. 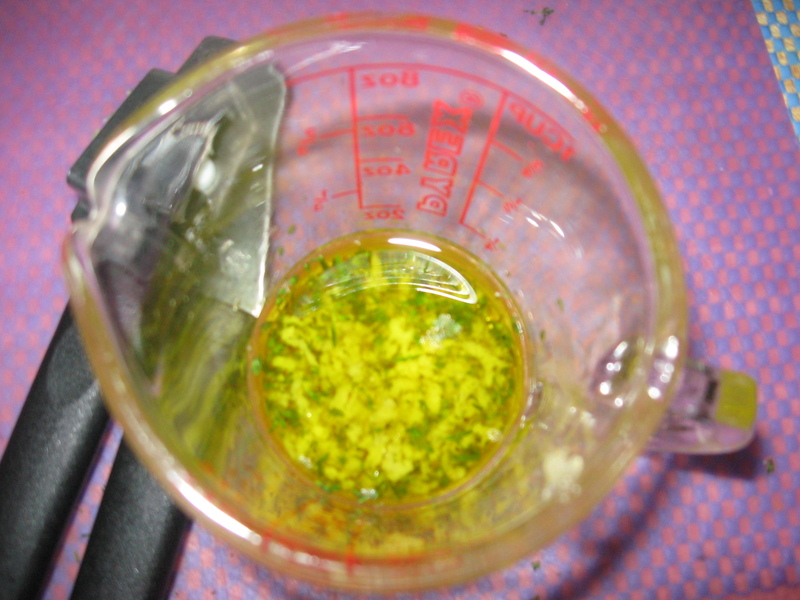 add olive oil and herbs…e.g. savory which is sometimes known as the “bean” herb, dill, or sage, or other favorite. Let stand for a bit to allow herbs and oil to meld with the beans. you can add them to cooked snap/string/green beans, or other green veggies. 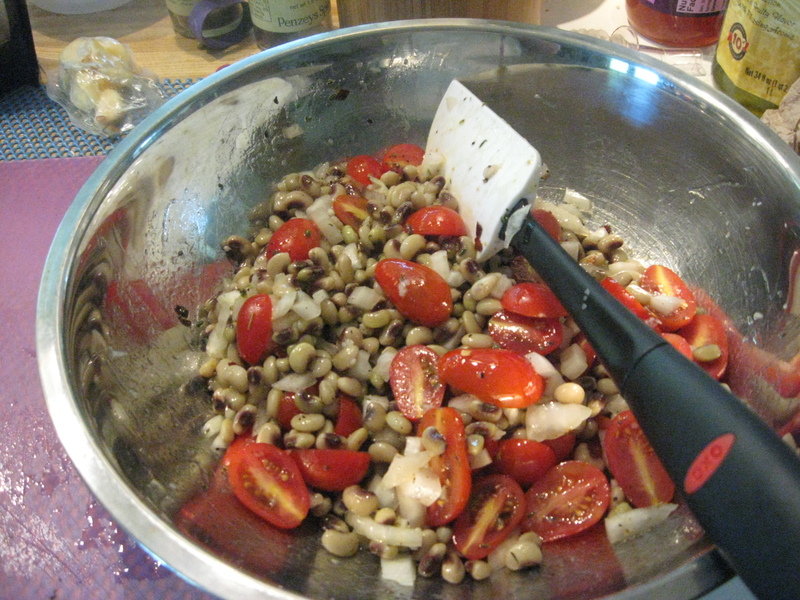 use cold or at room temperature with tomatoes to make a “bean salad”…. you can add them to rice. Remember that the combination of legumes and grains does provide good quality, complete proteins. then there’s “hoppin’ john”–Here’s a link to Emeril Legasse’s recipe. If you’re a Southerner, you probably have a variation of this. I’m not–but this one looks pretty good to me. They are versatile–and underappreciated veggies. My personal favorite for hot summer weather is to use them at room temperature for a “salad”. Here’s a rough guide to making this dish. steam beans/peas until tender–about 5-15 minutes. 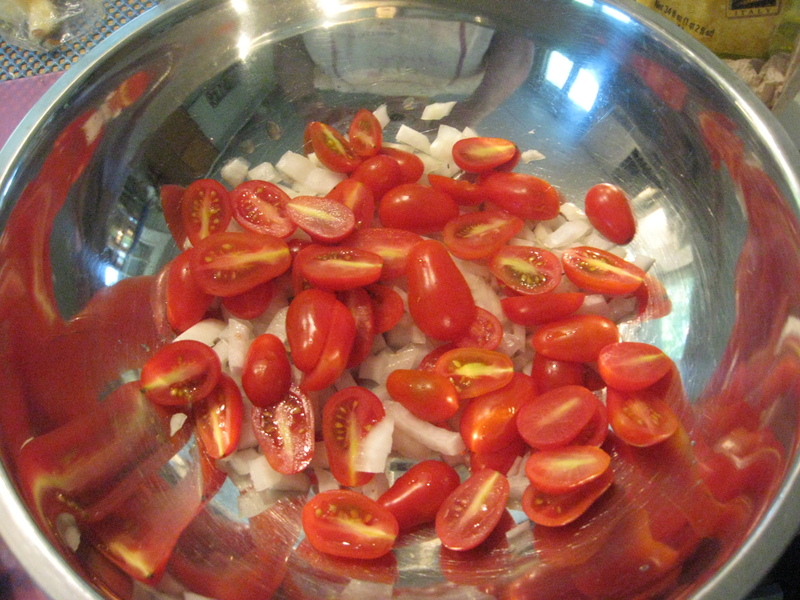 some cherry tomatoes, or dice large tomatoes, and place in a bowl. take enough extra-virgin olive oil to lightly coat the veggies and the beans (about 1 tablespoon per pound of beans) to a small skillet over very low heat and add crushed or very finely minced garlic and herbs of choice (savory, oregano, mint, ….) and allow to infuse for about 10 to 15 minutes; you don’t want the garlic to brown–so keep the heat very low–you just want the oil infused well with the flavors of the seasoning. Or heat the oil with the herbs and crushed garlic in a microwave safe container on low for about 4 to 5 minutes and let stand until cooled to infuse. combine ingredients and add salt and fresh-ground black pepper to taste. add a squeeze of lemon or a dash of vinegar (rice wine or sherry) to brighten it up and contrast with the earthiness of the beans/peas. if you have “leftover” rice in the fridge or freezer, you could add that to the mix to make this a light meal that has complete proteins. sprinkle with crumbled feta cheese; be careful how much salt you add if you’re going to use feta cheese with this. add chunks of good quality tuna (canned) or from “leftover” tuna steak (this would be worth planning to have some extra grilled tuna steak around). Now you say you have some lingering in the fridge and you’re tired of eating it? Well, try putting it into some rice as you’re cooking it–the purple-hulled peas usually hold shape well, and the tomatoes and onions will cook with the rice. Now use it as a side dish with grilled/griddled meat; you might want to add additional herbs to this. I grew up on pinto’s and navy’s but these purple beans are a curiosity to me. I have some that I bought hulled and frozen in my crock pot as I type. My worst fear is that they will taste like soy or black eyed peas. Yuck! The hint is the tip to add rice, onions and the like to them. That makes me suspicious they’re terribly bland. I’m afraid that I have to tell you they are very much like black-eyed peas or field peas. One thing you can to to make them a bit less bland is to use something like ham or some of the smoked turkey legs that are available in the supermarket. They don’t hold a candle to pinto or borlotti, or even canelinni beans.